Image caption Zoran Thaler says he was aware of being targeted in a "manipulation"
A Slovenian Euro MP has resigned after corruption allegations surfaced on Sunday - the second MEP to do so. Zoran Thaler said his resignation "should enable an investigation of all facts and circumstances of this attempt to compromise my name". Austrian MEP Ernst Strasser resigned earlier, after the UK's Sunday Times newspaper made the allegations. 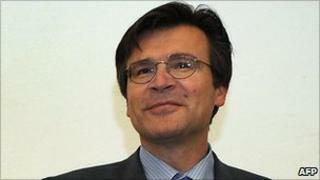 The paper alleged the pair and Romanian MEP Adrian Severin accepted offers of cash in exchange for influencing laws. All three have denied wrongdoing. The European Parliament is now investigating the allegations. Mr Strasser, a former Austrian interior minister, is in the centre-right European People's Party, while the other two are in the centre-left Socialists and Democrats (S&D) group. Mr Thaler's resignation statement on his website said that "in accordance with my ethical standards, I would like that the truth comes out and that it shows who acted legally and who illegally". Sunday Times reporters posed as lobbyists looking to hire politicians to amend EU legislation. They said the three MEPs agreed to take up the role for up to 100,000 euros (£87,000; $142,000) per year each. Mr Strasser's meeting with the undercover reporters was secretly filmed and appeared on the internet. The newspaper said some of the legal amendments now appear in the European Parliament's official documents.